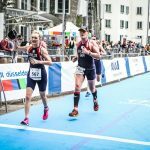 Since it started 8 years ago Ironman Wales has become one of the most iconic races in the calendar and has gained a reputation for being one of toughest Ironman courses out there. This is due to its generally lumpy 2.4 mile sea swim, followed by a 1 km uphill run to T1, followed by a hilly 112 mile bike, followed by a hilly 26.2 mile run. One other factor which has made Wales so iconic is the overwhelming support it gets from the local community and visiting race supporters alike. The allure of Wales proved too much for 6 of us from White Oak to resist, so at the end of last year entry forms were submitted, accommodation was booked and bank statements were ignored, we were in! The line-up included Mark O’Brien, Mark Milsom, Mark Spaul, John North, Will Birmingham and me. Sadly, only 5 of us would make it to the start line as Mark O’Brian had quite serious accident while out on his last training ride a few days before the race. Despite his injuries and needing crutches to walk Mark continued to show true Ironman spirit by coming along to support the rest of us. He has also submitted his entry for next year’s race! We arrived in Tenby Friday afternoon and couldn’t miss the fact that the race was on. Along with the steady stream of cars carrying flash bikes flowing into town the streets were lined with Ironman flags hanging from the houses and local businesses. Shop windows were dressed with all sorts of Ironman paraphernalia along with hand written messages of good wishes. Even the local Chip Shop proudly displayed a sign saying they would be open from 6am on the morning of the race. I was tempted! Saturday was race registration and race briefing in the morning then putting bags and bikes in to transition in the afternoon. We had lost Friday’s sunshine and the weather had turned a little Welsh so had a wet cycle into town to pick up our race packs and Ironman event bag. I got back to our accommodation and laid out the content to the race pack on the floor. I get the feeling a large portion of the entry fee for these races goes on bags. As well as the main event bag which is usually a ruck sack, there are plastic bags labelled Street Wear, Bike Gear, Run Gear, Bike Special Needs, and a pink one for the swim exit. I set about packing the bags accordingly paying particular attention to the Bike and Run bag because once they went into transition that afternoon I wouldn’t be able to touch them again until during the race. After another wet cycle back into town the bikes and bags were put into transition before going for a wonder round the packed expo. I took the obligatory picture of me pointing to my name on the back of this years merchandise before buying some of this years merchandise. By now the rain had left off and the clouds had started to clear so we went for an alfresco coffee before heading back to carb load, relax and turn in for an early night. I slept surprisingly well that night so when the 4am alarm went off I felt well rested. I had been feeling quite relaxed leading up to race day. Not because of any bravado or over confidence, quite the opposite in fact. Due to one thing and another my training this year never really came together and peak training just didn’t happen. Therefore, I had already decided my goal was simply to finish without putting any time expectations on myself and to enjoy the experience as much as I could. Breakfast was 2 pots of porridge oats with honey and an extra-large mug of tea, which I sat and ate in quiet solitude. Arriving at transition I loaded the bike with my nutrition and water bottles and checked the tyres and gears, remembering a head torch this year so I could what I was doing. I then changed into my wetsuit before dropping the Street Wear bag off on my way out of transition. I wondered up to Mark Milsom’s hotel with pink carrier bag in hand sipping on a bottle of water with Zero tab in. The O’Brien’s and Abi were setting up supporters base camp in Mark’s room as it was centrally located. The athletes were starting to line up for the swim outside the window and we heard the announcement calling all athletes to the swim start. Wetsuits were zipped up and hugs, kisses and handshakes sent us on our way. Mark and I made our way down to join the swim line. It had become apparent many months earlier when we all signed up that there is a higher force at work here preventing all 6 of us being in the same place and the same time. However, in true White Oaks style we had a WhatsApp group so knew the others were around and all set. Zig-zagging down to the beach I hung my bag on my numbered hook and continued to the beach. It was around 10 steps later I realised I still had my shoes on – Doh! I ran back to my bag took my shoes off and popped them in the bag. When walking down again I looked to see if anyone else had made the same mistake as me. As it turned out nobody had, it was just me! I stood on the beach with the sand between my toes for about 15minutes before the race started. I realised I was quite near the front and level with the swim exit, knowing the back of the line would be back past the hotel on the high street. I saw the opera singer sing the Welsh national anthem before zipping his wetsuit up and joining the rest of us. The elites and pros then set off. The sea was calm and the weather dry and mild, which after hearing the stories of last year I was relieved about. Then we were off! Two laps with an Aussie turn later I was running back up the zig-zag path towards my bag which a DQ if I forgot to pick up. The swim went well. The water didn’t feel as cold as the 16c temperature suggested and for the most part I managed to avoid colliding with my fellow competitors and didn’t drink too much sea water. I put my shoes on and grabbed the bottle of water out of my bag using some of it to rinse the salt water off my face and drinking the rest as I ran to T1. Running into T1 I grabbed my bag and headed to the changing area. After around 10 steps I realised I’d grabbed my Run bag not my Bike bag – Doh! I really wasn’t having much luck with bags. As I changed for the bike I had my one and only Gel of the day along of a cereal bar. The first ‘little loop’ on the bike was fast and scenic going around the coastline. Although it was hilly there was nothing horrible, that was awaiting us on the ‘big loop’. Food on the bike was flapjacks, Jelly Babies, Dates, Figs and Salted Peanuts washed down with either High5 energy drink or Zero. The little loop leads into the first of the 2 big loops which takes us off around Pembrokeshire. By this point I was realising that it really is never ending hills. There is absolutely no rest bite from them, you are either going up or down. Towards the end of the big loop a few miles before coming back into Tenby are the two steepest climbs on the course. Heartbreak Hill as the name suggests is an out of the saddle grind to the top. The second is only a short distance after it and has Tour de France style crowds up close and personal cheering you all the way to the top so there’s nowhere to hide. The top of this hill does have a reward in the shape of an aid station, and this one also has our Special Needs bags. I had packed a chicken and piccalilli sandwich into mine with salt and vinegar crisps. It was that thought which had been motivating me for the last 10 miles. I do not have a particularly sweet tooth so after a morning of eating sweet nutrition I’m craving something savoury and sharp. It was also around lunch time and I was hungry. I scoffed this down using the opportunity to have a stretch off the bike before restocking my nutrition and setting off again. The next mile or so was an easy role back into Tenby giving me a chance to reflect on where I was in the race. I still had another 47miles of bike to go and about to start the second big loop. My lack of fitness was now starting to show. My pace was dropping and I was seriously debating if I had another 47miles left in me especially as the last two hills were still fresh in my mind and legs. I also saw the race leaders had started on the run. Seriously!? As I got back into Tenby I was presented with two signs, left for transition, right for lap 2. A dark thought came into my mind, should I turn left and head back into transition and call it an DNF? I could be drinking beer within the hour while watching the race instead of risking blowing up somewhere out on the bike course. However, was that the story I wanted to tell and could I live with myself if I did? No on both counts. Right it was and off I set on the second loop. I settled into loop 2 quite quickly so was glad I made the right decision to carry on. My pace had slowed but it was steady. I then noticed a noise coming from the front wheel so pulled over to investigate and found one of the front brake pads was rubbing against the rim. I really didn’t need that on this course. I’m not sure how long it had been like it, not the whole race but remembered noticing something just before my sandwich stop which I then forgot to check. The calliper just needed realigning before I set off again. The repair didn’t seem to improve my speed too much so couldn’t have been slowing me down much either. T2 was a welcome sight. Most of the bikes were back by now but I had made it. Setting off on the run I walked the first 100m as I had developed a sharp pain in my left foot on the bike around 20miles from the end. I’ve had this before on long rides so was confident it would quickly go. My plan was to power walk the ups and run the flats and the downs. Plan B was to power walk the whole thing if my legs weren’t up to it. I broke into a tentative run and my legs felt fine, surprisingly fine in fact. 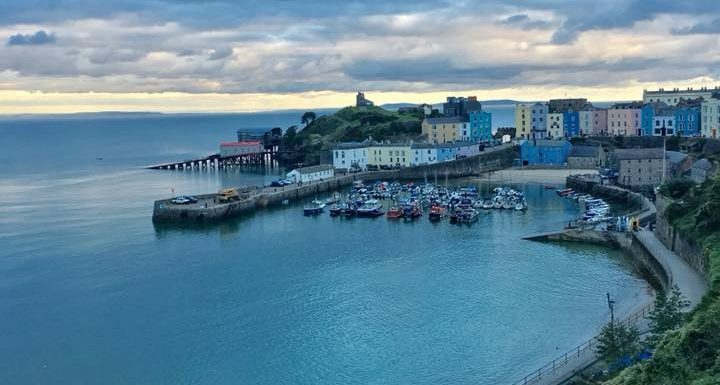 I ran out of the packed streets of Tenby on my first loop. There was a long but not hideous climb out of town along a residential road. Just about every house was out supporting the race and they were turning it into a street party. There was music and BBQ’s on the go and a lot were in fancy dress cheering us along. I later found out the entire course was like this. I shouldn’t have been surprised as the bike course was just as well supported. After this climb the course flattens out a little but being Wales nothing is truly flat so we had a slight incline for another mile or so to the first loop back at the Redbull stand. Feed stations were every mile or so on the run so it was never far to the next one. My plan was to stop at each one for a full cup of water and take a couple of mouthfuls of Redbull or coke. I would then eat half a banana and some Doritos at every third one. This seemed to work as my energy levels felt fine for the entire run. After the Redbull turn with the exception of two very short inclines it was down hill all they way until we got back into Tenby. I had heard some real horror stories about how hilly the run was but this wasn’t too bad at all. I found a running buddy on lap 2, Dean from Barnsley who was a lap ahead of me. He was good company so lap 2 passed quickly. Back in Tenby Abi ran alongside me on the pavement for a short while shouting updates on how the others were doing in the race which was nice to hear. Lap 3 was the best lap. I was feeling strong and it was Dean’s last lap so part of me felt obligated to make sure we kept the pace up. As we came to the split for my last lap and his victory run down the finishers shoot we bid each other fare well and went our separate ways. I was now on my own for the final lap. I looked at my Garmin and it said 20.6 mile and I was feeling good, for the first time I actually thought I can do this. Lap 4 was slower than 3 but still a good pace. I also made a point of thanking all the supporters I’d been chatting too on the way round as they certainly made the run so much more enjoyable. With 2 miles left I had my final water stop before heading for home. I was running past a lot of people which considering how the bike section went was the little ego boost I needed. Arriving back into Tenby the course twists and turns through the town before getting to the split where it was now my turn to head down the finishers shoot. The noise from the crowd was phenomenal and I was now on the red carpet crossing the finish line 15hrs 2mins after starting. I had done it! All 5 of us managed to cross the finish line that day and John, Will and Mark Spaul can now call themselves an Ironman! However fit you are this race will take everything you’ve got. This is just my story so please ask the others for there’s when you see them. Finally as always a special thank you to all our friends and families for their support without whom most of us wouldn’t have even made it to the start line. It really does make a difference and supporting for all those hours is an endurance sport in itself, thank you all! Club Curry Social Night & Club La Santa Meet – Fri 22nd Feb 8pm.